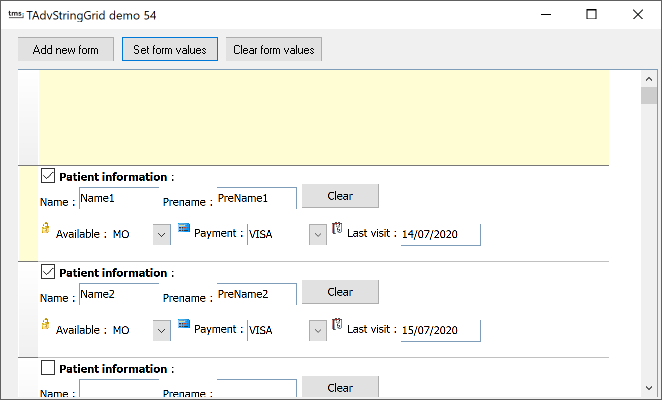 In response to many users asking to combine multiple buttons in a cell, to add more than one checkbox in a cell, to edit different items in a cell, mini HTML forms can bring a solution allowing unlimited capabilities to specify cell contents and behaviour. All events return the cell for the control, the control ID, type and value. For the OnControlComboList event, a stringlist is passed as parameter where the values that need to be displayed in the combobox can be added. With the Edit parameter, the combobox can be set as either dropdownlist (Edit = False) or as editable combobox (Edit = true).